For Day 21 of my "Christmas In July" Blog post, I liked to show you this painting that I had the previlege of doing with fellow ladies for Christmas Paint Night for a Ladies Night at a local church! Although I didn't know them before, the ladies and myself quickly introduced ourselves, shared common interests which is mostly kids and surving the holiday season then remember our "me time" and Christian fellowship! We ate a potluck of delicious goodies during our coffee (or tea or hot chocolate) breaks as the art instructor introduced tonight's painting topics which one of them is a Christmas tree!! 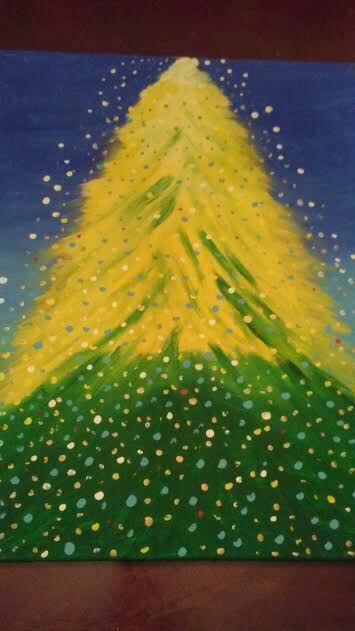 Inspiring individuality in our artwork with choice of colors and designs, I chosed the colors and the dots representing the glow of the Christmas tree during the season! I hope to do this again this upcoming Christmas season! What a great Christmas memory! And it sounds like a lot of fun too!